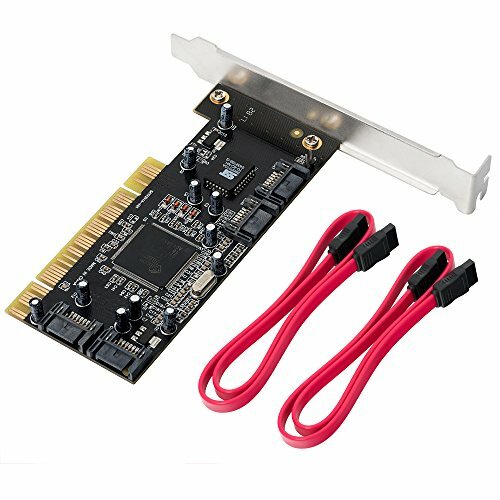 Add four independent SATA-I ports to your PCI equipped computer and enjoy the benefits of the optional software RAID configuration for added speed and/or data security with this adapter card.（Note it is PCI card,NOT PCIE card ). Plug the SATA RAID PCI card into the PCI slot on your motherboard, and connect SATA devices to the ports on the PCI card using the cables provided, or standard SATA cables of adequate length. The card comes with an optional RAID utility which lets you configure a RAID 0 RAID 1 or RAID 0+1 setup on two or more of the SATA ports. You can have one RAID 0 or 1 setup and two independent SATA drives two RAID 0 or 1 sets or a single RAID 0+1 set. SIL3114 chipset and supports two modes: 32-bit at66MHZ and 64-bit at 133MHZ.